I have been writing “A blog about Raising My Autistic Son” for just over a year during which time I have discovered that the title of my blog offends some people. Someone said they hated it when people used the term autistic to describe their child. People have suggested that by using “my autistic son” I am putting his disability before him, making it the main thing about who he is. I’m failing to use person first langauge. I was blissfully unaware of the controversy surrounding my use of the term ‘autistic’ to describe my son when I started blogging. Had I known I may have chosen a different title for my blog; I’m not after all trying to cause offence or be disrespectful. However you have to admit that “A blog about Raising my son who has autism” is an even less catchy title than the one I plumped for. It was Edward, my teenage autistic son, who chose the name for my blog as he was unhappy with all the name suggestions I had conjured up. I’ve been trying to figure out why people are so upset by me referring to Edward as “my autistic son”. I think it comes down to how you view autism and to a large extent how you view autism will depend on how it is affecting the person you know who has it. Edward does not have any additional learning difficulties, he can communicate using speech and language and he’s generally good company. I know that I’m totally biased but in my opinion he is intelligent, smart, inquisitive, confident, knowledgable as well as being an absolute stickler for rules and routines. He could win first prize in any pedantry contest hands down. He also has autism. He cannot separate who he is from his autism and if he tries to imagine a version of himself without autism he can’t because autism is very much part and parcel of his identity. He doesn’t view his autism negatively or positively but rather as something which has given him a particular set of strengths as well as challenges. If it were possible for him to trade his strengths for his challenges he would not even consider it for a moment. If there was a cure for autism he would not take it because he would become a less interesting version of who he is now. This is not to minimise the challenges and the difficulties he has in understanding and navigating social situations nor does it diminish the problems he has had with sensory processing. I have not forgotten all the times when he became stressed and agitated over things that wouldn’t have bothered his peers and siblings, even if they had noticed them. However his strengths exist because his brain is wired the autistic way which for him means that he has the ability to get deeply interested in a particular topic and he can analyse and remember information in a way that most people can only dream of being able to. I’ve come to the conclusion that the label autistic is only offensive if “autistic” is viewed in an entirley negative way. Our experience of autism means that we don’t view it like this. In his ground breaking book, ‘NeuroTribes’, Steve Silberman refers to an autistic man called Jim Sinclair who was involved in the launch of the first autistic run organisation in history, Autism Network International. Members started to refer to themselves as Autistic in the 1990s instead of saying that they were people with autism. Silberman quotes Sinclair as follows, “Saying ‘person with autism’ suggests that autism is something bad – so bad that it isn’t even consistent with being a person. We talk about left-handed people, not ‘people with left handedness’, and about athletic or musical people, not about ‘people with athleticism’ or ‘people with musicality’.. It is only when someone has decided that the characteristic being referred to is negative that suddenly people want to separate it from the person’. Whilst many adults like Sinclair would say “I’m autistic” rather than “I have autism” I’m also aware that some adults would prefer to say “I have autism” rather than “I’m autistic”. To be honest I don’t really mind which term people use and I think I use both interchangeably in my blog posts (including this one – did you spot them?) 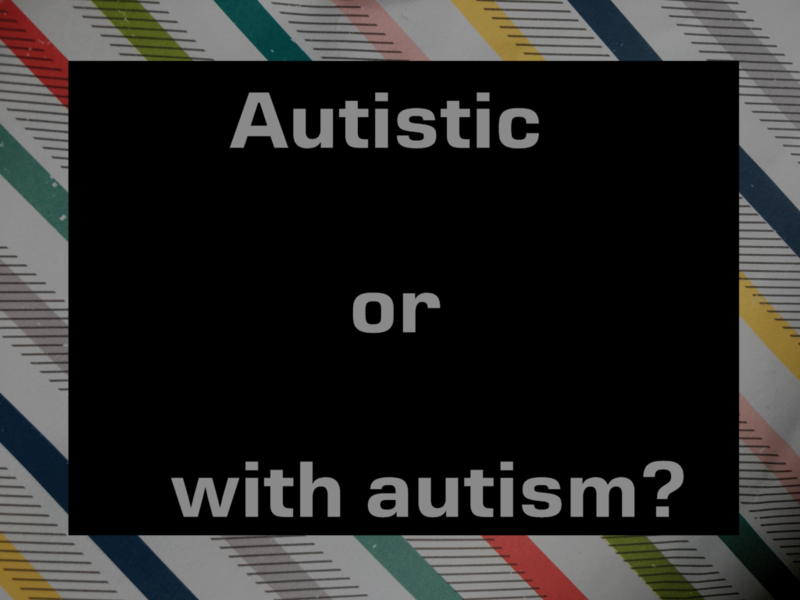 as well as the more all-encompassing and less controversial term, “on the autistic spectrum”. If I know someone prefers not to be referred to as autistic but rather as someone with autism I’ll do my best to use the language that makes them feel comfortable. Likewise I hope that people in the ‘person with autism’ camp can understand and respect my decision to use the label, ‘autistic’. Nick and I will continue to view Edward’s autism as a celebrated and integral part of who he is and not some dark pathological shadow hovering over his identity. He is our wonderful and much-loved autistic son. YES YES AND THRICE YES!!! Brilliant post and perfectly apt for in World Autism Awareness Week #WAAW. Oscar says “I’m autistic” most of the time; less frequently he might refer to “his autism”. I have a number of friends who have their own preferences and, like anything, I use the terminology which that person prefers. This, to me, is what ‘person first language’ should be – not putting the physical person first, but putting the person’s preferences first. He’s currently planning a review for his YouTube channel where he will be reviewing himself and explaining, in his own words, how it affects his life – both the positive and the negative. It sounds like Oscar has designed a fantastic T shirt – brilliant. Best wishes for his review of himself – I’d love to see that! Do let me know when it is available to view. We have a similar dilemma with a ‘diabetic’ child. Interesting debate – think I’m with you. I hadn’t thought about other life long conditions when I wrote this piece – but I can see how this is a similar issue. Thanks for your comment. I agree that how we describe ourselves is a personal choice. Thanks for hosting #TweensTeensBeyond – It’s a great new linky! Hi there for what it’s worth, I follow your Facebook page , which was recommended to me my a dear childhood friend who works with Autistic adults and I not only enjoy reading what you write about your son, your relationship with with him and his progress in society, but it’s helped me on a personal level as my ex boyfriend has a 9 year old son with Autism. Your writing has helped me relate better to him and to other people I meet who are on the spectrum. Indeed, many of my adult contemporaries who we previously thought were quirky or unusual are now getting a late diagnosis of ASD. Interestingly, in my job within adult mental health we have recently been advised not to describe our clients as having Asperger’s syndrome, but to say they are on the Autistic Spectrum. Unfortunately I don’t know the reasoning behind this change of language so am unable to justify it at present . Thank you for your inspiring column, I hope you will feel supported by other readers, whom I am confident you offer comfort and motivation to with your experiences put into words on your page . 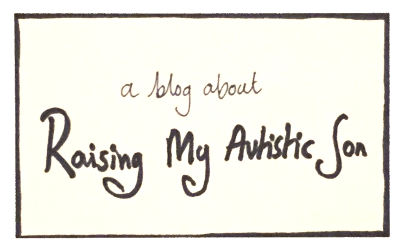 Thank you so much for leaving this comment – my aim in writing this blog is to shed more awareness and understanding about autism, so hearing how my blog has helped you was a real boost. I’ve actually written a post about why aspergers is no longer used as a diagnostic label – here’s the link if you would like to read it. http://ablogaboutraisingmyautisticson.com/good-bye-aspergers-hello-autism/. I have an autistic son called Edward too, known as Ted and I am also autistic. I think that the term ‘autistic’ seems to be bandied around certain quarters as an insult, but I’m proud to be #ActuallyAutistic. I hadn’t realised that there was a debate over terminology and it is a shame if that detracts from the great blogs out sharing this subject. It’s your blog and you, and Edward, can call it what you want and I agree your idea is a lot more catchy! It’s impossible to please all the people all of the time. Thanks so much for sharing with us at #TweensTeensBeyond. This is a really interesting and thought provoking piece.- I am both a parent to an autistic child myself and a SEND training consultant and I encounter this division of opinion all the time in my work. Many parents of children with visible disabilities often tell me that they need the “person first” description because they are fed up with society only seeing the disability. Or seeing the disability first before the child. I find that interesting, because those of us like yourself who have children who appear “typically developing” and their disability only comes through in their behaviour often yearn for better understanding from society. I hadn’t thought about how the visibility (or not) of a condition influenced the language used to describe it. When my son was little I was keen to let people know early on about his diagnosis so that they had more patience and understanding towards him. Now he is getting older I’m stepping back more and leaving it up to him to decide if he wants to disclose his diagnosis or not. You definitely echo my thoughts here Lynne. I’m learning from the autistic community and trying to use terminology that they prefer. On the other hand, I’ve also been questioned over my use of non-PC terminology from professionals and other parents. Sometimes I feel caught in the middle of two worlds. However, I’m trying to guide my kids to accept themselves for who they are and autism is an instrinsic part of them. Like you, I’d never change them or try to cure them. Love this post! I’m a woman, not a person with femaleness. I’m autistic, not a person with autism. Brilliantly and succinctly put – thanks!